Winter is the time when evergreen trees are most noticeable in our gardens, and few stand out more than holly does. These handsome trees and bushes, with their rich-green leathery leaves, bring structure and form to the garden, and their rounded or pyramidal shapes are perfect additions to any garden. The classic ‘greeting-card’ holly, with its spiny leaves and red berries is an essential ingredient of the holidays, and the season would just not be the same without it. Holly has far more uses in our gardens, though, as it is ideal for hedges and screens, as well as for specimens to decorate the lawn or stand boldly behind smaller shrubs. Many people think one holly is much the same as another, but in fact this large group of plants is very variable and exploring it a little brings to light some terrific garden plants that might otherwise be overlooked. Holly bushes are found in most parts of the world, and it surprises many people to discover that they are abundant in tropical and sub-tropical countries. The classic holly, Ilex aquifolium, comes from Europe, but when the first explorers and settlers arrived in North America, they discovered holly trees growing wild across most of the country. Yet strangely today, even those that are widely grown are rarely recognized as native American trees. With the present interest in growing native trees rather than alien species, it pays to explore a little more closely just exactly what we have available, and what terrific garden plants they are. With that in mind, let’s take a look at the native holly bushes we can grow in our gardens – you might be surprised at their diversity. First on the list must be this tree, which most closely resembles the European holly. Known as Ilex opaca, this tree is the Queen of the native hollies, and widely regarded as the best of all the larger, tree-like holly bushes. It naturally grows into a handsome pyramid of rich-green spiny leaves, and in fall and winter it is covered in large red berries. It is more resistant to both cold and heat than European hollies, yet it is just as handsome. Wild trees can grow over 30 feet tall, but most garden forms have been selected for their smaller, more compact growth, and a final size of perhaps 20 feet is normal. The branches can be retained right to the ground, or pruned up to reveal the smooth, light-gray trunk, making a more tree-like specimen. There are many varieties, and among the best is the Greenleaf Holly, with very rich foliage and abundant berries. Not all holly bushes have red berries, and this native species, called Ilex glabra, has black ones. These may not be as striking as red berries, but this plant has virtues far beyond its berries. Do you have areas of shade, wetter or drier soil than normal, more acidic or alkaline soil, or just spots where not much grows? Then you need the Inkberry. For all those awkward areas where you want a dense, evergreen bushy plant that is easy to grow, undemanding, and yet handsome, this under-utilized shrub is the answer. You may not at first realize it is a holly, since the leaves are smooth and spineless. 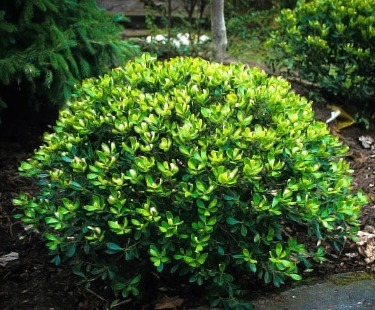 Choose a smaller, denser selection – the Compact Inkberry is a good one – as the wild tree can become a bit large and need regular trimming. The Compact Inkberry stays just 4 or 5 feet tall, and its bushy form fills spaces effectively, along a stream, or in any wet soil, as well as in ordinary to dry soil. This undemanding plant will grow in sun or shade too, and it looks good in a wild garden or in a more organized one, where an occasional trim will keep it suitably neat. Reflecting its wide distribution across the country, from Nova Scotia to Florida, you can grow this bush almost anywhere, from zone 4 to zone 9. All hollies don’t have red berries, and neither do they all have evergreen leaves. Look at the narrow, lighter-green leaves of the Winterberry, and you will not think it is a holly at all, but when winter comes and those now-bare stems are covered in bright red berries, you will probably realize it is. Called Ilex verticillata, the Winterberry is hardy into zone 3, and it will bring you holly berries in gardens too cold for any of the evergreen species. This upright shrub will grow to be 4 to 6 feet tall, and it thrives in those damp parts of the garden, in sun or partial shade, where the choices of plant can be limited. Improved forms with names like Berry Heavy Winterberry have been developed, that carry exceptional crops, and cut in vases in winter these stems are popular, especially in the colder states. It grows naturally throughout the east, and don’t forget to include one or two males in your planting – like many other holly bushes the Winterberry fruits best when there are males around to pollinate the flowers of the female berry-carrying bushes. Although not widely grown in gardens, there are other native holly trees of interest. Among them is the dahoon, Ilex cassine, which grows in warmer parts of the South, in Texas and even across to the Bahamas. Another holly with smooth leaves, and so not very like a holly, it grows into a small rounded tree with bright berries. If you want to try it, look for improved varieties like ‘Autumn Cascade’, which carry very heavy crops. As well, there is a very attractive hybrid between the dahoon and the American holly, an upright, columnar tree called ‘Savannah’. 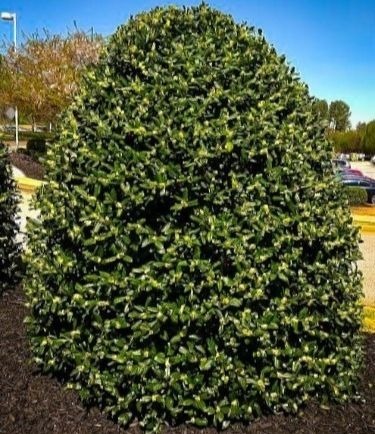 This unique holly makes a beautiful specimen tree, with a heavy berry crop, and it is very suitable for hotter areas, and very drought resistant. It’s a highly-recommended and unique tree. 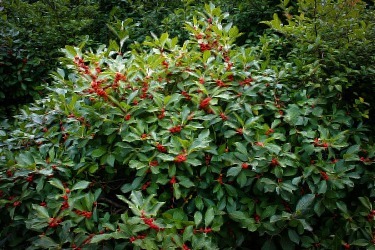 Besides the widely-grown Winterberry there is another native holly that drops its leaves in winter – the Possumhaw, Ilex decidua. Growing from Virginia to Florida it has abundant berries, but it is only suitable for the largest garden, as it grows very large, and suckers vigorously to spread into wide clumps. Finally, we should mention the unfortunately named Ilex vomitoria, which sounds more appealing under its common name, the Yaupon. Although associated with Georgia, it grows from Virginia to Florida and west to Oklahoma, becoming a rounded tree 10 or 20 feet tall. Perhaps it is the unfortunate botanical name, but this tree is not widely grown in gardens, which is a shame, because it survives almost anything, from wet soil to dry, and both acidic and alkaline conditions, plus salt spray and even the constant trimming of obsessively-neat gardeners. If not over-trimmed it produces good crops of red berries too, and it is available in compact selections that grow only 4 to 6 feet tall. Perhaps some kindly botanist will rename it, and we will see this plant soar up the garden popularity charts. As you can see from this brief survey, gardeners committed to growing native trees have lots of choices among the hollies, so no-one needs to go without those beautiful berries in winter. It is also clear that all gardeners can benefit from paying attention to these great native plants, that have so much to offer in any garden, all across the country.